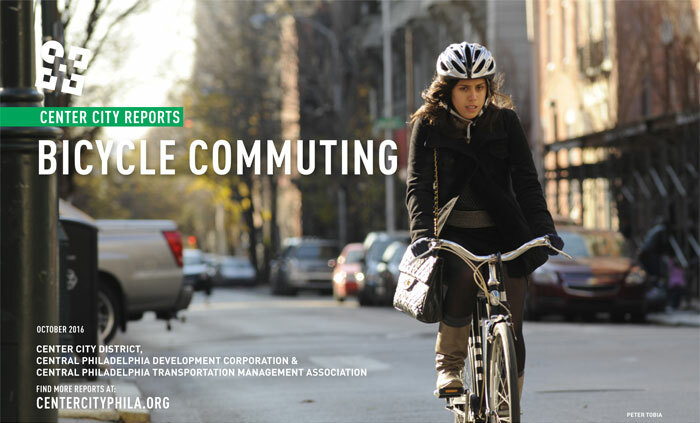 The Center City District and Central Philadelphia Development Corporation have released Center City Reports- Bicycle Commuting, a survey of this increasingly popular mode of transporation for Philadelphians. A mid-September survey conducted by the Center City District (CCD) showed the number of bike commuters was up 22% over the CCD’s last count in 2014, and up 79% since CCD began surveying bicycle commuting patterns in 2010. On 11 northbound streets, plus the South Street entrance to the northbound Schuylkill River Trail, 1,400 bicyclists entered downtown during the weekday peak morning rush hour, 8:00 a.m. to 9:00 a.m., with new highs observed on every street surveyed. Indego bike share, introduced in Philadelphia in April 2015, constituted 6% (an average of 87 per day) of bicycle traffic observed during the morning rush hour. Philadelphia’s dense, compact live-work downtown and relatively flat topography are excellent for bicycle commuting, especially for the 42% of working residents who live and work in Greater Center City. Despite growing popularity, however, bicycling faces some challenges. Philadelphia’s 17th century street grid, narrow streets, curbside parking and relatively short blocks with frequent stops act as de facto traffic calming, keeping vehicle speeds closer to bike-friendly velocities. But the narrow streets also leave little room to insert dedicated bike lanes without removing parking or existing vehicle travel lanes. Philadelphia’s limited enforcement of many forms of illegal parking by trucks, as well as illegal behavior by cyclists, also compound the challenges. To view or download the report, Click Here [PDF, 2.8 MB].